In this report we provide unique and valuable insights into Online Search Data for Funeral Directors looking at funeral related consumer behaviour when searching Google and browsing funeral director websites. Our research is drawn from Google Analytics Reports across our client websites as well as data from Google Trends. What Does Google Trends Tell Us About Funeral Related Searches? 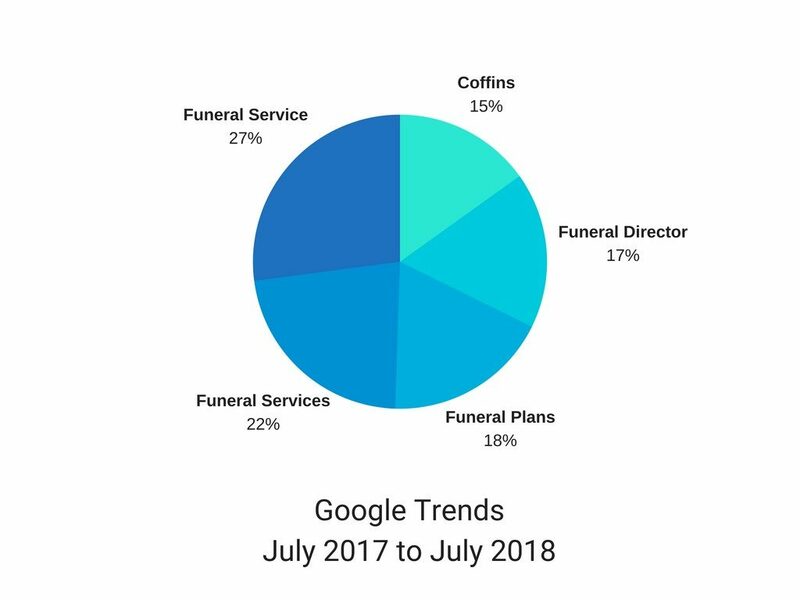 We’ve taken a comparative overview of UK wide funeral related searches from July 2017 to July 2018 as provided by Google Trends and Google Analytics data. The statistics demonstrate that people are making more searches for wider funeral related topics than they are for a funeral director. A website may look attractive however we can’t take it for granted that prospective customers are arriving on the website or that the website is serving them the information they are looking for. It is possible to ensure that a website is fit for purpose and that money invested achieves maximum possible returns. The term ‘responsive’ in terms of websites refers to how the website layout responds to different devices, i.e. mobile, tablet and PC. This is important however, ‘responsive’ has another crucial meaning. Is the website responding to the information people are searching for? Is it providing what they want or is providing what we’ve guessed they want? Google Trends - What are People Searching For? Google Trends shows that the search term ‘funeral director’ was used in fewer searches than ‘funeral service’, ‘funeral services’ and ‘funeral plans’. In relation to funerals therefore, people are mainly interested in finding details of an upcoming funeral service, a standout opportunity for any funeral business to draw people to their website. Interestingly, the most popular term in our study is ‘funeral service’ at 27%. Why is this interesting? It’s of interest because the next most popular search term at 22% is ‘funeral services’. Bearing in mind our findings from our clients’ websites (below) ‘funeral service’ can relate to people seeking information about specific funeral details of someone they know i.e. ‘funeral service of Tommy Brown’. 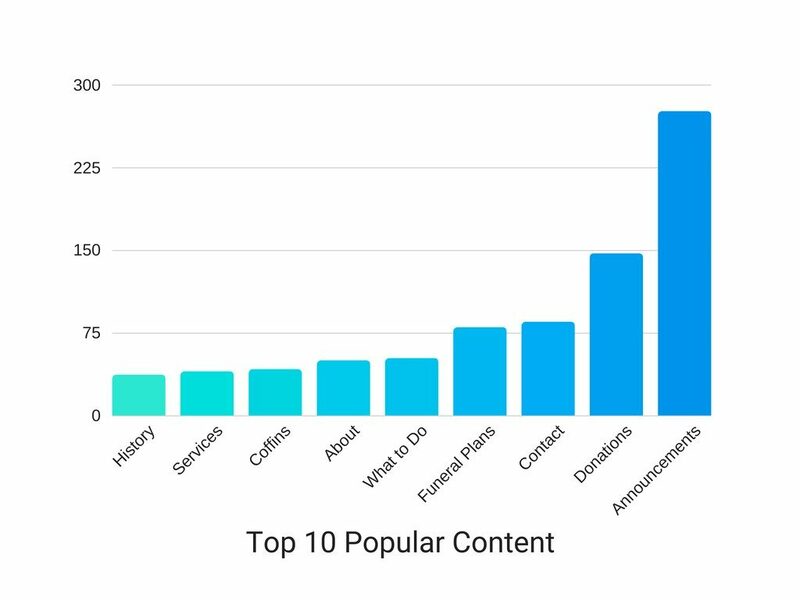 The search term popularity chart demonstrates that most of the audience are not necessarily at the point of need i.e. not ready to buy. Marketing a funeral business can be a challenge. Death remains ‘taboo’ and most people avoid the subject. A funeral director recently recounted the occasion where he was chatting to a friend outside his premises and invited her in for a cup of tea. The friend responded with ‘Oh no! I’m not coming in there! The same can be said of a funeral director website; the opportunity to attract people to ‘come in’ are limited we therefore need to be strategic. Marketing is about raising awareness of our business before people are ready to buy (or 'at need') so that we will be the preferred option at the buying stage. Approximately half of the websites in our study have a Funeral Announcements page. The graph below shows the aggregated number of page visits across all websites with Funeral Announcements. 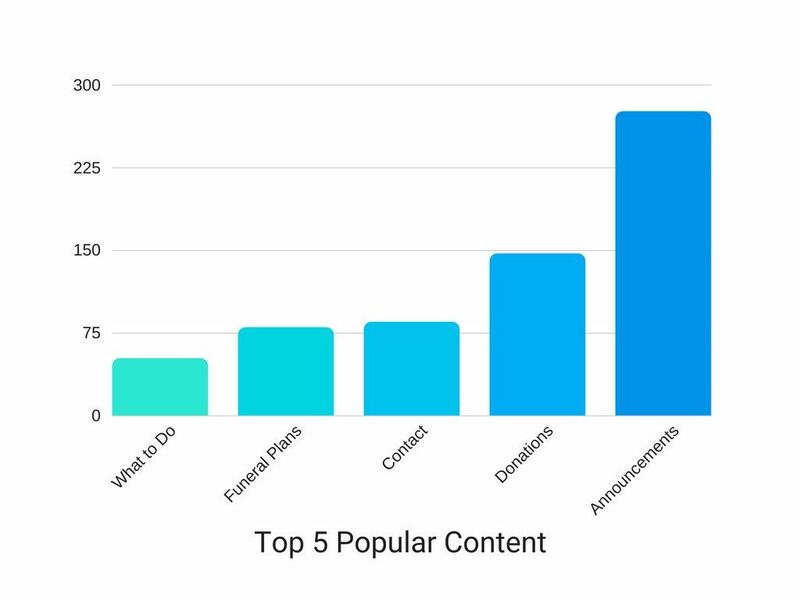 Google Analytics data tells us that Funeral Announcements are consistently the most frequented page on websites that make them available. Will a competitor gain trust ahead of you by responding to prospective customers? Your website has a truly ground-breaking advantage as a marketing tool when compared to more traditional advertising mediums. You can measure exactly what people are looking for, serve them that content and gain their trust. Or, if you prefer, don’t serve them what they’re looking for. Either have no website and be of no help or have a poorly prepared website allowing a competitor to gain trust instead by responding to prospective customer searches. ‘Content marketing’ or ‘Inbound Marketing’ is not complicated. It is in fact much more simple and transparent than the old ways of promoting a business. Look back twenty or even ten years ago and consider how much money was spent on press and publications where the effectiveness was difficult to be sure of. Inbound marketing is a cornerstone of the ‘Web 2.0’ concept in that it can be self-generated, timely content from the website owner. ‘Inbound’ refers to the fact that prospective customers are willingly coming ‘in’ to view your content as they have an interest in that information. How Many People go to the Funeral Announcement Page Each Month? This chart shows the number of visits to the top 5 of our websites who have a Funeral Announcements page. 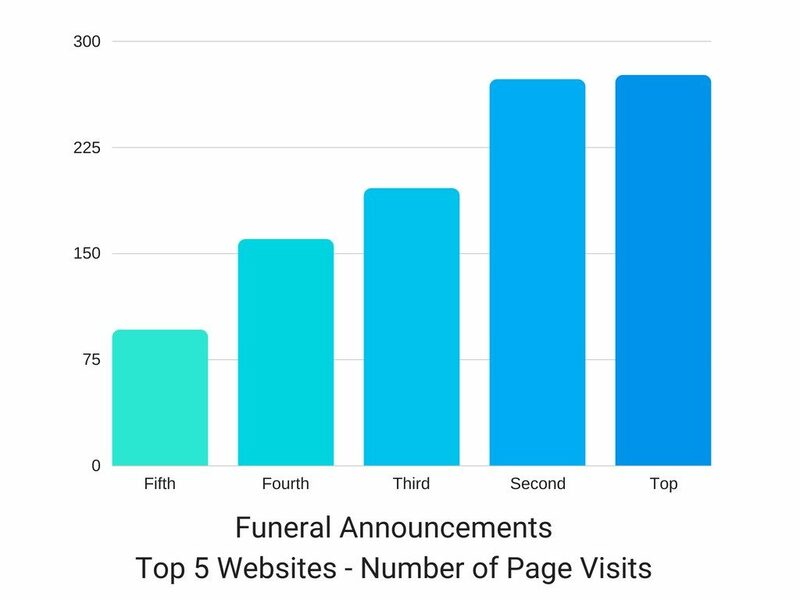 Across our websites Funeral Announcements are consistently the top performers with even the least visited Announcements page on one of the lower traffic sites (75 unique visitors per month) ahead of the next most visited page (Contact) of the busiest website. If most related searches are not people ‘at need’ i.e. not ready to buy, then it follows therefore that a website should serve them with the information they are looking for. Because of known browsing habits, once we’ve attracted a visitor to the website i.e. with funeral announcement information, there’s every chance that they will go on to visit other pages. Looking beyond the information that is most sought after it is also important to respond to known consumer online behaviour. Many people are carrying out in depth research online, they may want to find out more detailed information about someone who has passed away beyond just the funeral time and date. They may need a map to show them the funeral location, they may want the opportunity to leave a tribute or a make a charitable donation. Once a visitor is on our website we can engage them with other useful content. Website content doesn’t need to be speculative, we can make use of known facts and by serving the people we want to engage with successfully now so that we have gained trust and visibility later when they may buy, i.e. when they are ‘at need’ or perhaps purchasing a funeral plan.